Other Sights for Artists’ Projects is a non-profit society based in Vancouver that operates as a collective of individuals with expertise in curation, project management, presentation, delivery and promotion of temporary art projects in public spaces. Other Sights is dedicated to challenging perceptions, encouraging discourse and promoting individual perspectives about shared social spaces. Other Sights seeks to create a presence for art in spaces and sites that are accessible to a broad public, such as the built environment, communications technologies, the media, and the street. Operating outside of the gallery context, Other Sights develops new and unexpected exhibition platforms and provides support to artists, writers and curators interested in creating temporary, critically rigorous work for highly visible locations, presenting projects that consider the aesthetic, economic and regulatory conditions of public places and public life. Image 1: Deadhead, by Cedric, Nathan and Jim Bomford, 2014. Photo by Mike Love. 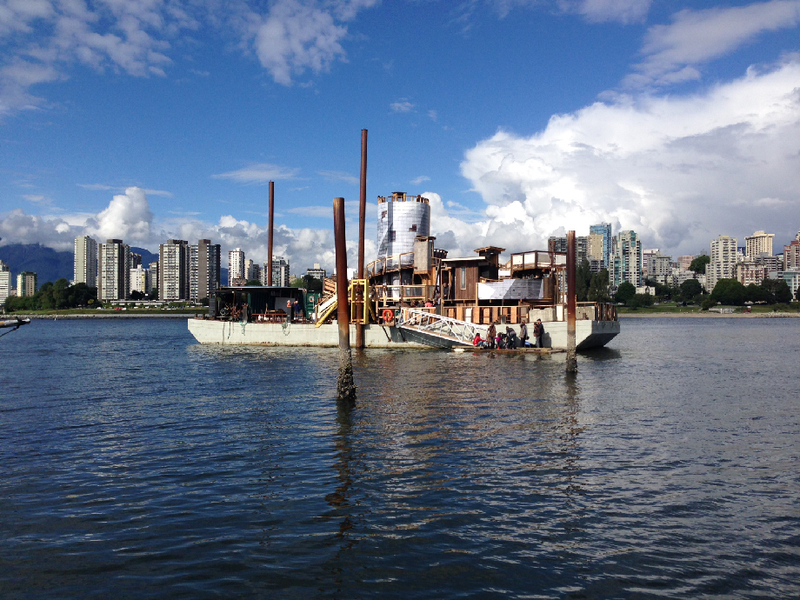 Dead­head is a large-scale sculp­tural instal­la­tion mounted to a barge and towed by tugboat to dif­fer­ent loca­tions along Vancouver’s water­ways. Cre­ated by Cedric Bom­ford in col­lab­o­ra­tion with his father Jim Bom­ford (a retired engi­neer), and brother Nathan Bom­ford (an artist and builder), the sculp­ture is con­structed pri­mar­ily from sal­vaged mate­ri­als, with some sec­tions wrapped in pho­to­graphic murals. A curi­ous marine out­post, Deadhead’s enig­matic spaces are designed for pub­lic access. This float­ing art­work began its life on the water with sum­mer moor­age in Her­itage Har­bour at the Van­cou­ver Mar­itime Museum from June 14 to Sep­tem­ber 2, 2014. For sched­uled pub­lic events, vis­i­tors were fer­ried from the Museum dock to the barge to expe­ri­ence and explore the structure. 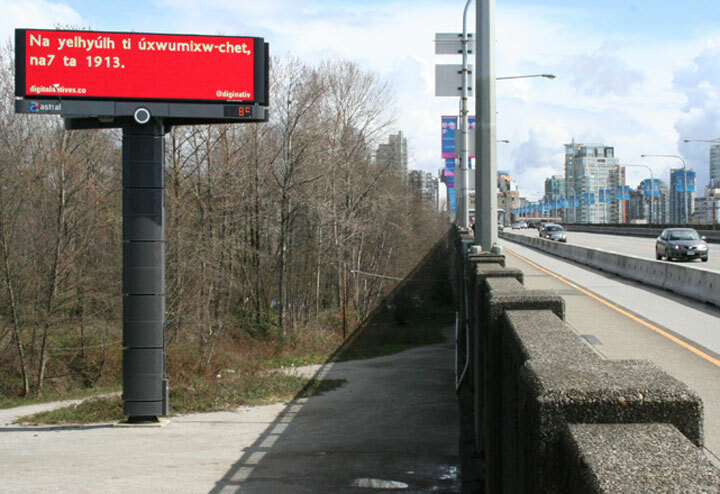 Image 2: Digital Natives, electronic billboard, Vancouver, 2011. For Dig­i­tal Natives, the bill­board became a space for exchange between native and non-native com­mu­ni­ties in an explo­ration of lan­guage in pub­lic space. Using the form of tweets, artists and writ­ers from across North Amer­ica con­tributed text mes­sages for broad­cast dur­ing the month of April, coin­cid­ing with the 125th Anniver­sary of the City of Van­cou­ver. Inter­rupt­ing the flow of adver­tise­ments, the brief mes­sages responded to the loca­tion and his­tory of the bill­board; of dig­i­tal lan­guage and trans­la­tion, and of the city itself. Image 3: Monument to Mysterious Fires, billboards, Vancouver, 2015. Transforming two bill­boards at Que­bec Street and 6th Avenue into a tem­po­rary mon­u­ment, Other Sights com­mem­o­rat­ed the fire in Mount Pleasant during the Christ­mas of 2009 along­side the Great Fire of 1886, an event that harkened the orig­i­nal devel­op­ment of Mount Pleas­ant itself. Address­ing the east/west and the north/south axes of the city and how they fac­tor in the cur­ren­cies of ‘views’ as well as the esca­la­tion of property val­ues creep­ing east­ward, Mon­u­ment to Mys­te­ri­ous Fires triggers his­tor­i­cal and recent mem­o­ries of the neigh­bour­hood. The bill­boards, set per­pen­dic­u­lar to one another, carve out a sculp­tural space within a park­ing lot, in which to gather and reflect on the trans­for­mation of the city. Presented as part of the 2015 Capture Photography Festival.